روش­های ژئوفیزیک برای مطالعات منابع آب کارستی و فهم بهتر ارتباط تکتونیک منطقه با پدیده کارستی شدن، در روستای زوباران از توابع شهر قوچان و در داخل آهک­های سازند تیرگان انجام شد. روش­های مغناطیس‌سنجی کاربردهای گسترده­ای در اکتشاف گسل­ها و شکستگی­ها دارد. گسل­ها به عنوان یکی از فاکتورهای فعال کننده پدیده کارستی شدن مورد توجه هستند. در مرحله اول مطالعات مغناطیس‌سنجی زمینی با رزولوشن بالا خطوارهای مغناطیسی را در منطقه آشکارسازی کردند. در مرحله بعد مطالعات توموگرافی الکتریکی عمیق، بر اساس نتایج مرحله اول انجام شد. سه مقطع توموگرافی الکتریکی دوبعدی با آرایش الکترودی ونر- شلومبرگر و حداکثر عمق اکتشافی 250 متر به صورت عمود بر گسل­های احتمالی (به دست آمده از نتایج مغناطیس‌سنجی) برداشت شد. ابتدا با مدل‌سازی معکوس دوبعدی داده­های مقاومت ویژه الکتریکی و سپس با نرم‌افزارهای درون­یابی، نمایش سه‌بعدی انجام شد. نتایج مطالعات نشان‌دهنده 2 منطقه با مقاومت الکتریکی پایین است که مربوط به زون­های خرد شده یا انحلالی هستند و موقعیت آنها با گسل­های اکتشاف شده در مرحله قبل مطابقت دارد. در این مطالعه هدف معرفی و صحت‌سنجی یک فرایند اکتشافی بهینه در مطالعات منابع آب کارستی است. در مرحله اول مغناطیس‌سنجی به عنوان یک روش سریع و ارزان‌قیمت انجام و موقعیت زون­های مستعد احتمالی با دقت بالایی تعیین می­شود. 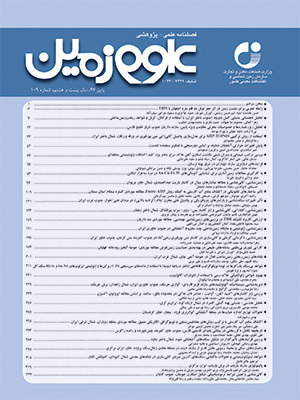 در مرحله دوم مطالعات دقیق توموگرافی الکتریکی با صرف زمان و هزینه بالاتر در زون­های مستعد متمرکز و عمق و نحوه گسترش نواحی کارستی شده آشکارسازی می­شود. Geophysical surveys have been carried out to characterize the structure and to better understand the karstic water reservoirs in the Quchan area. Deep 2-D resistivity tomography and magnetic method have been used to detect the most promising zones for new water-well siting. Magnetic method has a common usage in the interpretation of the tectonic framework, faults and fractures that are triggering parameters of karstification phenomena. Therefore a high resolution magnetic survey was carried out as the first detection approach at selected sites in the studied region with the aim of probable buried fault exploration for karstic zone detection. The geomagnetic results detect magnetic anomalies in NW-SE direction agreed with the known faults system in the area. As the second approach, a Deep Electrical Resistivity Tomography (DERT) process has been designed according to magnetic results. Tree sections of 2-D electrical tomography using the Wenner-Schlumberger array has been carried out along a survey line of 100 m and an investigation depth of about 250 m with resolution of 5 m. The 2-D inversion modeling provides suitable information about the exploration targets and essential geological formations. The studies illustrate that low resistivity areas on the sections related to karstic zones. We used this combination of geophysical methods in this study to prove that these geological phenomena can be detected by such quick, economic and confident sequence of geophysical methods. Baranov, V., 1957- A new method for interpretation of aeromagnetic maps: pseudogravimetric anomalies. Geophysics 22, 359-383. Billi, A., Filippis, L. D., Poncia, P., Pio Sella, P. and Faccenna, C., 2016- Hidden sinkholes and karst cavities in the travertine plateau of a highly-populated geothermal seismic territory (Tivoli, central Italy). Geomorphology 255 (2016) 63–80. Branston, M. W. and Styles, P., 2006- Site characterization and assessment using the microgravity technique: a case history, Near Surface Geophysics, 4, p. 377-385. Cardarelli, E., Cercato, M., Cerreto, A. and Di Filippo, G., 2010- Electrical resistivity and seismic refraction tomography to detect buried cavities: Geophysical Prospecting, v. 58, p. 685–695. Chromčák, J., Grinč, M., Pánisová, J., Vajda, P. and Kubová, A., 2016- Validation of sensitivity and reliability of GPR and microgravity detection of underground cavities in complex urban settings: Test case of a cellar. Contributions to Geophysics and Geodesy. Volume 46, Issue 1, Pages 13-32.
Cooper, G. R. J. and Cowan, D. R., 2006- Enhancing poetential field data using filters based on the local phase. Computer and Geosciences, Vol. 32, pp. 1585-1591. Dahlin, T. and Zhou, B., 2004- A numerical comparison of 2D resistivity imaging with 10 electrode arrays. Geophysical Prospecting 52, 379e398. Ford, D. and Williams, P., 2007- Karst Hydrogeology and Geomorphology, John Wiley & son Ltd, England, pp. 1-562. Gambetta, M., Armadillo, E., Carmisciano, C., Stefanelli, P., Cocchi, L. and Tontini, F. C., 2011- Determining geophysical properties of a near-surface cave through integrated microgravity vertical gradient and electrical resistivity tomography measurements: Journal of Cave and Karst Studies, v. 73, no. 1, p. 11–15. Hanafy, S. M., Aboud, E. and Mesbah, H. S. A., 2010- Detection of subsurface faults with seismic and magnetic methods. Arab J Geosci DOI 10.1007/s12517-010-0255-6. Jeng, Y., Lee, Y. L. Chen, C. Y. and Lin, M. J., 2003- Integrated signal enhancements in magnetic investigation in archaeology. J. Appl. Geophys. 53, 31–48. Kaufmann, R, D. and DeHan, R. S., 2007- Microgravity Mapping of Karst Conduits within the Woodville Karst Plain of North Florida, Symposium on the Application of Geophysics to Engineering and Environmental Problems (SAGEEP ’07), Denver, Colorado, SAGEEP, Vol. 20, p. 1517-1526. Khalil, M. H., 2016- Subsurface faults detection based onmagnetic anomalies investigation: A field example at Taba protectorate, South Sinai. Journal of Applied Geophysics 131 (2016) 123–132. Loke, M. H. and Barker, R. D., 1996- Rapid least e square inversion of apparent resistivity pseudo e sections by a quasi enewton method. Geophysical Prospecting 44, 131e152. Mathe´, V., Le´veˆque, F., Mathe´ P. E., Chevallier, C. and Pons, Y., 2006- Soil anomaly mapping using a caesium magnetometer: Limits in the low magnetic amplitude case. J Appl Geophys 58:202–217. McDowell, P. W., 2002- Geophysics in Engineering Investigations. Geological Society Publishing House. Mendonca, C. A. and Silva, B. C., 1993- A stable truncated series approximation of the reduction-to-the-pole operator. Geophysics 58, 1084–1090. Miller, H. G. and Singh, V., 1994- Potential field tilt — a new concept for location of potential field sources. J. Appl. Geophys. 32 (2–3), 213–217. Mochales, T., 2006- Prospeccio´n magne´tica aplicada a la deteccio´n y caracterizcio´n de dolinas en el entorno de Zaragoza. Unpublished MSc University of Zaragoza, 191 pp. Orfanos, C. and Apostolopoulos, G., 2011- 2D–3D resistivity and microgravity measurements for the detection of an ancient tunnel in the Lavrion area, Greece. Near Surface Geophysics, 2011, 9, 449-457. Pesonen, L., Nevanlinna, H., Leion, M. A. H. and Ryno, J., 1994- The earth's magnetic field maps of 1990. Geophysics 30, 57–77. Salem, A., Williams, S., Samson, E., Fairhead, D., Ravat, D. and Blakely, R. J., 2010- Sedimentary basins reconnaissance using the magnetic tilt-depth method. Explor. Geophys. 41, 198–209. Vaziri, S. H. Majidifard, M. R. and Saidi, A., 2001- Geological map of Iran 1:100,000 sheet No. 6962, geological survey of Iran. Zhou, W., Beck, B. F., Adams, A. L., 2002- Effective electrode array in mapping karst hazards in electrical resistivity tomography. Environmental Geology 42, 922-928. Zieliński, A., Łyskowski, M. and Mazurkiewicz, E., 2016- Ground Penetrating Radar investigation of limestone karst objects in the Botanical Garden in Kielce. Geology, geophysics & Envirnoment. vol. 42 (1): 31–38.